The Aliante Stile have been already presented here on TNT-Audio during the factory tour at the Pininfarina plants in Turin we did last Autumn. Since then a pair of Aliante Stile has been playing Music into my "secondary" listening room for months, waiting for this listening test to be eventually written down. Because of a small technical problem, suddenly solved by the kind Ing. Prato (Aliante's chief designer), this listening test appears terribly later than previously scheduled. Anyway, as far as I know this is still a World premiere issue for these new entry-level babies from Aliante, the Italian firm well known for its collaboration with the Centro Stile Pininfarina in Turin, which is responsible for the fancy-looking aesthetics and colors. The Stile are pretty compact (190 x 230 x 320 mm) bookshelf loudspeakers and they have been easily installed into my budget reference system, into the smaller room (a larger room hosts the "expensive" reference system). Two side-firing reflex ports show the close relationship of these new speakers with the more expensive Aliante Moda, successfully reviewed here few months ago. The cabinet, already pretty sturdy because of its small size, is damped via two additional side panels, available in electric blue, metallic grey and classical walnut. On the other hand the design is a pretty traditional one, a two ways bass-reflex with a 26 mm dome tweeter (internally oil-damped) and a 10 cm long-throw smallish woofer, a newbie at Aliante. The crossover network has a classical 6 db/oct slope and makes use of selected caps, claimed sensivity is 88 dB, nominal impedance is 6 Ohms (4 Ohms minimum) and max power handling should be around 90 watts. The ubiquitous Aliante binding posts :-( allow just a simple and logical (given the "target" of this project) monowiring. For more infos and tech details please refer to the nicely built Aliante official site. As you may see in the picture below the Stile is available in the aforementioned three different "styles" :-) in order to make the choice (and furniture-matching) easier. The Stile project was meant to fit a common customer's needs: good sound, easy installation even into recessed places (remember the side-firing reflex ports), cool looks and a world-famous design (Pininfarina designs Ferrari cars...). So the "target" is quite different from the one of a strictly audiophile-oriented design like the Aliante Spazio, for example, which cost more or less the same. Hence the tonal balance is quite different and the sound appears to be slightly more vivid and even brighter. The highs are a bit forward and so is the mid range. Thanks God the bass range helps to counterbalance this attitude, being powerful and incredibly deep, considering the size of the woofer and of the cabinet. Just to clarify things a bit, when compared to the bigger Tannoy Mercury M2, equipped with a 16 cm woofer, the Aliante Stile have showed more or less the same amount of bass, with even a slightly better articulation. So the Stile do have a weighty bass and, while this appears credible into smaller rooms it remains quite good even into larger rooms. No, it is not the walls shaking kind of bass but still something that can add "weight" to the Music reproduced by the smallish Italian babies. The mid range, as noted above, is a bit forward and shows some rudeness and harshness especially at the upper-mid. Voices sometimes fail to be warm and sensual, sounding slightly metallic and edgy. It is clear to me that the designer, having a certain "customer" in mind, has looked for an artifical "presence" effect, but clearly the tweeter isn't able to do that without adding something of its own. So even the lower part of the high range is slightly of the tizz tizz kind. Anyway, when placed into small rooms, matched with fine budget amps, the Stile can sound very vivid reproducing with a good sense of realism pop/rock tracks (even hip hop!) as well as small jazz or classical ensembles. Plenty of life. This can summarize the dynamic performance of the Stile. It is the woofer that really amazes for its dynamic capabilities: even when "forced" with extremely bad and complex tracks (Prodigy's "The fat of the land", for example) it reacts without fear though sometimes it seems it is going to "leave" the cabinet (it's quite long-throw speaker, indeed). This, as you already know, comes at a price. The sense of speed and rhythm. It is clear that the woofer sounds and reacts slower than the tweeter, both during attacks and decays, so you get a feeling of a singular double speed kind of sound. This is quite common for small loudspeakers with a good bass frequency response. The dynamic performance of the mid/high range is undoubtly strange: fast and responsive the upper end, much slower and shy the lower end, like there was a problem at the crossover frequency. The Stile can sound quite loud though I'd not suggest placing them into large rooms. The "load" seen by the amplifier is of the easy kind and thanks to the sensitivity any decent audiophile integrated can successfully drive the Stile. There's no need to use outrageously large amounts of watts, even a good 20 watters can get the job done. 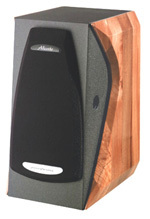 Aliante does have a well known tradition: making loudspeakers that simply disappear into the listening room. The Stile act no different, despite the "forward" mid and high range, these little babies disappear while playing, though not as magically as their bigger sisters. Trying a strongly toed-in position seems useless and even harmful: clearly the off-axis emission of the tweeter isn't all that good and hence one can hear a distinct "hole" in the frequency response. A moderate toe-in may help to "tame" a little the tweeter emission (and so the ubiquitosly useful Aliante felt demi-rings supplied). The soundstage is quite wide and deep, well beyond the loudspeakers, with a quite good sense of precision of the contours. Anyway, considering these loudspeakers have been designed mainly for the a "next door's guy" pair of ears, I guess soundstaging and 3D imaging are not a real problem here. Though I suggest using a good pair of speaker stands the Stile can, thanks to the side-firing reflex ports, sound good even when placed like the majority of customers place their loudspeakers i.e. casually near the rear wall. I suggest using good quality cables, possibly with a warm high range like some Monster Cable models. The break-in time suggested by Aliante is strictly necessary: the little woofer needs some work-out to rock'n'roll at its best. Well, it is clear the Pininfarina design and the superb finish come at a price. The sound quality alone, in my humble opinion, is barely sufficient to justify the required price and it is quite easy to find better sounding loudspeakers for less. Without taking into consideration other brands, please consider the Aliante Spazio: same price, far better audiophile sound. But then, you don't have the Pininfarina design and finish. Sonically I'd have preferred a smoother midrange and warmer high range, together with a more coherent timing and sense of pace. Are you a die-hard audiophile? Buy a pair of Aliante Spazio instead. Unless you are looking for a whole different concept. For example: are you searching for the ultimate WAF (Wife Acceptance Factor)? Can't you buy yourself a Ferrari but still want a Pininfarina designed object that even plays good Music? Look no further: the Stile are for you. They will play your favourite Music for hours, happy and bright like an April sky. A huge thanks you to Ing. Giuseppe Prato and the whole Aliante staff for having sent us this pair of speakers for reviewing.